Some assignments can make you tremble with excitement over the potential for a really creative application of lighting. Other times, you wind up in an impossible lighting environment and just want to bury your head in the palms of your hands in a gesture of total resignation. So it was with the Kohl Mansion. The house, completed in 1914, had a great hall with 30 foot ceilings and dark, hardwood panelling. It was the scene of Music at Kohl Mansion, a series of performances that often highlight up and coming artists, as was the case this evening. 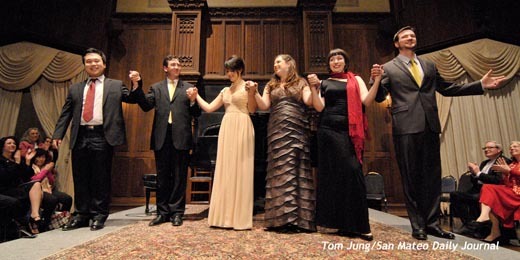 Five opera singers and their pianist performed a variety of arias from the operas of Pucinni, Mozart, and Wagner. 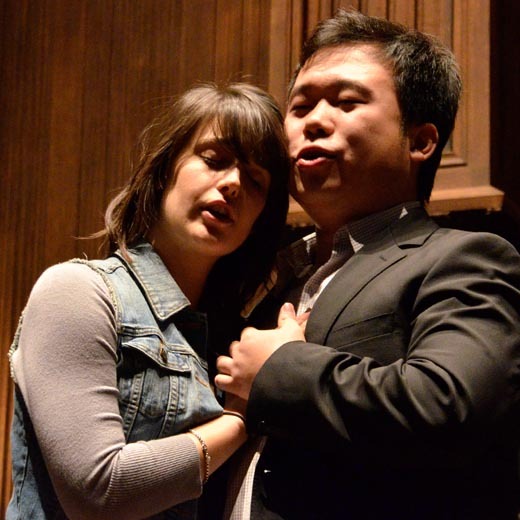 These performers were all part of the Adler Fellowship Program which offers intensive individual training and roles in San Francisco Opera’s main stage season. 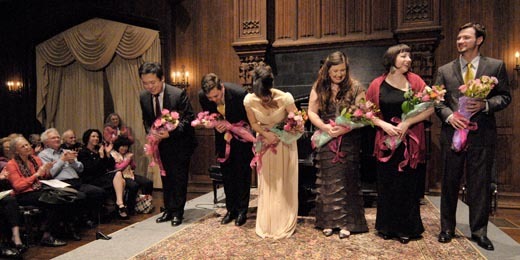 From left to right, baritone Ao Li, pianist John Churchwell, mezzo-soprano Laura Krumm, soprano Marina Bourdart Harris, mezzo soprano Renée Rapier, and bass-baritone Ryan Kuster. Back to the great hall. Since the room was not designed with photographers in mind, the lighting was totally inadequate for the purpose. High wattage incandescent spot lights lit the scene from high above, as you can see by the shadows. The dark walls prevented any light from providing volunteer fill. In short, it was raccoon eyes, to the max. The only saving grace was that the lights illuminated the floors evenly, owing to their placement in the ceiling. During rehearsals, I made a quick photo without a flash, just to see how bad it really was. The camera was set as follows: 1/50, F5, ISO 3200, tungsten White Balance. There is almost no detail whatever in the shadows. I decided that flash had to be used, but not at the expense of the disrupting or distracting the performers or the audience. An unposed, but well composed, shot of the performers, preferable with all of their faces visible, and recognizable. Luckily for me, there was an isle between the rows of seats perfectly centered with the front of the stage. This would be my vantage point. There was plenty of room for my light stand, with convenient seating located nearby. CTO Gel To The Rescue: I installed one of Nikon's full CTO equivalent gels on an SB-800 speed light so the light would match the Incandescent White Balance setting on the camera. Now it just so happens that the Wide Adapter, when positioned on the front face of the flash head, is very handy for keeping the custom-cut Nikon colored gels in place. Unfortunately, it will also spread your light over a much larger area and therefore reduce the intensity, so I needed to secure the filter without using the Wide Adapter. I used the small piece (or "stitch") of gaffer tape I normally keep on my speed light just for this purpose. Up Up And Away: I raised an SB-800 speed light with the full CTO gel high up on the light stand. I wanted to be sure that should an overly enthusiastic "paparazzi" in the front row decide to stand, he or she wouldn't cast a shadow on the performers. I positioned the stand as far away from the stage as I could to minimize any front to back variations in exposure from the speed light. Also, the body of the speed light was turned so the sensor faced forward so it could "see" my camera-mounted commander flash. Moment Of Truth: The young performers took their bows amid the applause of the appreciative audience. I was photographing at the forward edge of the stage using an SB-800 as a commander pointing backwards towards the remote flash on the lightstand behind me. I took an "action" from Neil van Niekerk's playbook and slipped a "black foamie thing" on the flash head to minimize the chances that my pre-flash would inadvertently blind somebody. I had two versions of the same shot: One with the performers bowing, and one with them all looking up. I chose the later. I used a wide angle lens and a low angle to capture some of the grandeur of the venue, most of which was later cropped out by the editor. Woulda, Coulda, Shoulda: One big bump occurred along the way. When using my on-camera flash as a commander, it was necessary to maintain a "line of sight" relationship with my remote speed light high up on the lightstand. During the actual presentation of the bouquets, I knelt for get a better angle. Unfortunately, several audience members stood behind me and started making photos of their own. Their height, coupled with my low position, interfered with the line of sight communication, and the main light didn't go off. While I had a wireless trigger in my bag, I didn't think I'd need it, since the system worked so well when I made the test shots before the performance. But triggering issues aside, the high mounted flash, working as a fill light, provided a wide range of mid tones between the bright highlights and the dark shadows, and while gave the midtones a subtle sense of form. The performer's facial expressions are clearly visible, adding to the excitement of the moment. The final photo reproduced reasonable well in the paper which affirmed that my approach had been correct, so far as the image was concerned.